Rook, a member of the crow family, with its greyish white face and beak, peaked head, and ragged “trousers”, is a familiar bird on the mainland adjacent to Arran, breeding in communal noisy rookeries. On Arran it does not breed but it is a regular winter visitor. Rook is resident in Great Britain and Ireland as well as much of north and central Europe. It is also a vagrant to Iceland and northern Scandinavia and occurs as an eastern race in Asia. Birds were also released by settlers to New Zealand between 1862 and 1874 where it is now an agricultural pest and is being eradicated. In the north of its natural range the species has a tendency to move south during autumn and even the more southern populations may range sporadically. What about now? 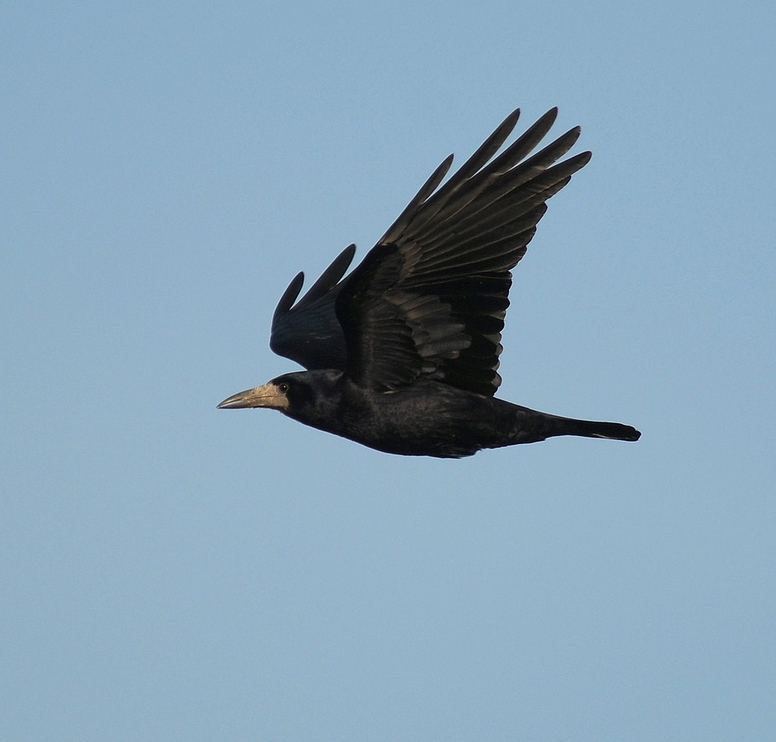 In the latter part of 2013 there were groups of Rook in the south of Arran, particularly around Sliddery. The numbers built up from mid-October and continued to the end of the year. On one occasion over eighty birds were counted. The numbers of birds recorded this winter is larger than recent winters. With many of the birds recorded this winter being juvenile, could this be an indication of an attempt to colonise Arran? In an attempt to answer this question the Arran Natural History annual reports from 1980 until 2013 were scrutinised. In five of these years there were records of more than one hundred birds. In one year it was four hundred. Over that same period, in five years records of less than ten birds were recorded, whilst in two of these years, no Rook was recorded. What could explain these fluctuations? Some of it can be explained by the fact that the island is under-watched and under-reported, but perhaps of more significance is the migratory nature of the species. Rook moves out of its northern range in the autumn and even the more southern populations are apt to range sporadically in search of food. The publication The Migration Atlas: movements of the birds of Britain and Ireland (Wernham, C.V., Toms, M.P., Marchant, J.H., Clark, J.A., Siriwardena, G.M. & Baillie, S.R. (eds.) 2002: T. & A.D. Poyser, London) indicates that in the UK there have been over sixty recoveries of ringed birds from foreign countries. These birdsfromto theStates. The movements of Rook not only from the adjacent mainland but from further afield, including northern Europe, could explain the fluctuations in numbers in Arran in the winter. Will Rook stay and attempt to breed in 2014? Rook start breeding early in the year with many on nests in March. This year, the agricultural land on the south of the island will certainly be worth checking.